If you're looking for a way to add commenting to an otherwise static page, the Google Sidewiki element gives you an easy and simple way to collect and display comments about a page. One of the new and exciting features of the Sidewiki element is that it allows visitors to leave a comment even if they do not have Sidewiki or Google Toolbar installed. 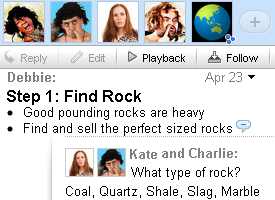 Like all Sidewiki entries, the comments in the element will be ranked to show the most useful items more prominently. 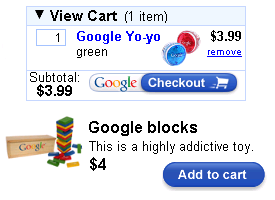 The Google Checkout element allows you to quickly and easily create an online store using a spreadsheet. Once you have a Google Checkout merchant account, you just have to add details for each item you're selling into a Google Spreadsheet, then use the wizard and copy/paste the code into your website. The element is compatible with Blogger, Google Sites, iGoogle, and personal websites where HTML can be modified, but doesn't require any programming skills or experience. In fact, you can get your first online store up and running in under five minutes. The Google Wave element enables you to quickly drop a wave -- a shared workspace -- onto your own website. The wave could be used for many different things, including: encouraging collaborative discussion among the visitors, or as a means of publishing content on the page. For deeper integrations of waves onto your own site, please check out the recently improved Wave Embed API. For more information on embedding waves, see the Google Wave Developer Blog post. Adding a virtual keyboard to your site just got easier with the Google Virtual Keyboard element. After choosing a keyboard layout, copy and paste the HTML into your page and voila, a virtual keyboard will be able to enter characters into any text input or text area on your page. If you've never heard a virtual keyboard, it's an on screen keyboard which translates the input from one keyboard layout to another and it allows users to type their own languages on foreign keyboards or by clicking the on screen display. Google Web Elements are great for folks who don't have much time or experience. However, even for advanced developers, elements are a great starting point, as most are backed by an underlying API to give you even more control over the content or look and feel. Take a look at all of the elements at http://www.google.com/webelements and stop by our help forum if you have any questions. Today we've added four new Google Web Elements: Sidewiki, Checkout, Wave and Virtual Keyboard. These are all designed to help you quickly and easily integrate Google products into your website. 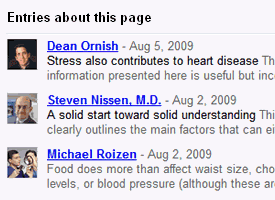 Google Sidewiki makes it easy for visitors of your website to share helpful information with each other. Unlike regular comments, all Sidewiki entries are ranked by usefulness so that the best ones are shown first. The element was built entirely on the Sidewiki API and can be customized in many ways to fit into your site. Sidewiki originally launched as a feature of Google Toolbar and as a Chrome extension - this element is our newest step in making Sidewiki more open and accessible across the web. If you'll be using the element on your site, let us know via @googlesidewiki on Twitter! Great. I'm waiting for virtual keyboard layout for Vietnamese. Google Checkout element is very useful service. Hello world in Greek is "Γειά σου κόσμε!". I've always been a fan of the quick out of the box approach because it is sufficient enough for many cases.. and when it isn't, it is still great because it allows you to have something in place to service your customer as you complete a more customized look and feel through use of the APIs for each of the elements. Thanks Google! Great development ideas from google... the Web Elements: Sidewiki, Checkout, Wave and Virtual Keyboard. These are really helpful ideas that can be incorporated into any website and can really make it easy for the customers on your website. A web pro-gramming service can help a grow and push a business even further by helping de-velop their website. These google services are a great way to get started; but are not sufficient enough to continue with the growth of your website. We do jus that for your website. We are a montreal based web programming company. You can visit us at : http://www.itmontreal.ca/ where we have a list of services in which we offer for your business needs. I directly use the API to create a Gadget for Google Sites.